Why not head for la Truffiere de Péchalifour to meet up with Monsieur Aynaud at his truffle farm, only a few miles from St Cyprien? Edouard Aynaud is the leading authority on truffles in the region, supplying most of the five star restaurants of the area. Péchalifour, is just a tiny cluster of houses; the stone buildings are steeped with old-world bucolic charm and in the midst of the beautiful Périgord countryside, which is a picturesque sight in any weather. Farah, the truffling hunt dog, hard at work! After a very animated, passionate and informative introduction to the history and science of truffle cultivation, Edouard, owner and expert truffle guide, will set out with the expectant truffle hunters directing his enthusiastic truffle hunting dogs; Farah a busy border collie and Titeuf the semi-retired golden Labrador. The aim of the visits is simple: any visitor should be able at the end of the visit to find a truffle in its natural environment! Farah is fully tuned in to the pay-for-performance system in operation, and sits close by her master as soon as she’s done her job to wait for her little treat. Occasionally she tries to help with a bit more digging if the human truffle hunter is not proving as adept at recovery as Farah would like. 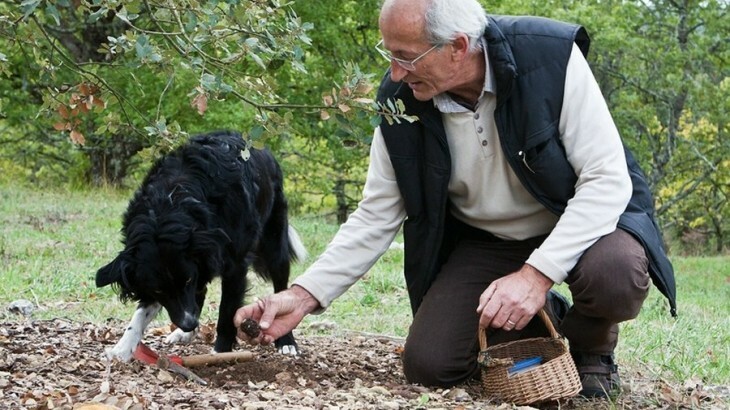 She’s recalled to sit with a reminder that “he will find it” and once the truffle is carefully dug up with the special digging tool or bare hands she gets her reward. After a thoroughly entertaining hour of sniffing and digging there was a good haul of walnut sized truffles in the basket. These truffles are the black Périgord variety. Amongst the multitude of interesting facts and figures about truffles, Edouard will also inform you how to store your truffles and serve them. To complete this interesting and informative visit why not stay at the neighbouring Guesthouse, Le Chevrefeuille in Pechboutier, who run one day cookery courses and whose resident chef would be on hand to advise you on recipes and ideas for this regional delicacy. Truffles can be found on the local market like Le Bugue and Sarlat. You can take part in a one hour visit in the summer or alternatively, a longer 2 hour visit (by appointment) the rest of the year. Edouard and Carole also offer tasting meals alongside the truffle farm visit. Check their truffle farm website for full details and tariffs.